Posted by mike on Thu, 05/23/2002 - 21:03. What kind of strat or pickups can i use to get Gilmores dark side of the moon tone. Posted by matt on Tue, 09/06/2005 - 06:10. A CBS-era large headstock Strat with a DiMarzio FS-1 in the bridge. : What kind of strat or pickups can i use to get Gilmores dark side of the moon tone. Posted by John on Thu, 05/23/2002 - 23:25. For that Guitar tone, you want a 68-71 fender strat Stock. Posted by Genrik on Wed, 06/12/2002 - 03:03.
no way, a stock one wouldn't do the trick! gilmour used a dimarzio pickup in the bridge, but no one seems to know the model of the pickup. i think aftermarket pickups would sound different than stock ones. : : What kind of strat or pickups can i use to get Gilmores dark side of the moon tone. Posted by mike on Fri, 05/24/2002 - 00:39.
: For that Guitar tone, you want a 68-71 fender strat Stock. Posted by Vince on Thu, 05/23/2002 - 17:51. Posted by filmour on Wed, 05/22/2002 - 21:47. What's the best adjusting for thr bridge? I've this one all crushed so I can do the vibrato only down. What about Gilmour's Strat? In the video (Pulse or Delicate) it seems to me he uses the tremolo arm up and down. So if it's real, there is a problem: when you have to do some bendig, you have to pull the string a lot because now the bridge go up (it is not blocked). Posted by matt on Tue, 09/06/2005 - 06:16. On his Strats, Gilmour screws down the six screws that attach the trem to the guitar for better tuning stability and has four trem springs in the back when playing live and three for studio work. Also he cuts the tremolo arm in half so he has better control of it while playing. : What's the best adjusting for thr bridge? I've this one all crushed so I can do the vibrato only down. What about Gilmour's Strat? In the video (Pulse or Delicate) it seems to me he uses the tremolo arm up and down. So if it's real, there is a problem: when you have to do some bendig, you have to pull the string a lot because now the bridge go up (it is not blocked). Posted by Syd on Tue, 05/21/2002 - 09:27. I have som problems setting the delay on ABITW Part 2 (Live, PULSE), an Run Like Hell (PULSE). Any suggestions? Posted by gae on Mon, 06/03/2002 - 15:57.
: I have som problems setting the delay on ABITW Part 1 & Part 2, and Run Like Hell. Any suggestions? Posted by JEStoner on Wed, 12/10/2003 - 16:03.
: : I have som problems setting the delay on ABITW Part 1 & Part 2, and Run Like Hell. Any suggestions? Posted by riis on Mon, 05/20/2002 - 19:09. I've listened to a few bootlegs from the Eclipse tour of 72. On Any colour you like there is a strange double track sound on Dave's solo. It sounds like he is singing along with his playing, like he did on the the first section on the studio version, but he does it through the whole solo without singing out of tune or improvising. Sounds like his mic and guitar both runs through a Leslie speaker. Any thoughts? Posted by the squirrel on Mon, 05/20/2002 - 16:04.
wich is a good volume pedal? Posted by JOhn on Tue, 05/21/2002 - 08:05.
: wich is a good volume pedal? Posted by Manu Duran on Mon, 05/20/2002 - 09:07. Knows anyone how D.G makes the cry you can hear in the central part of Echoes, and you can hear also in another song in the Wall??? Posted by cosmic on Wed, 09/07/2005 - 17:53. Posted by Jason on Tue, 05/28/2002 - 18:12.
: Knows anyone how D.G makes the cry you can hear in the central part of Echoes, and you can hear also in another song in the Wall??? This question has come up quite a few times in the past. You need an 'old' wah-wah, like a crybaby. The newer ones have extra buffer circuitry that stops it working. Second, you need a guitar with passive pickups, active ones WILL NOT WORK because they have built-in preamps. Third, connect the output of the guitar to the OUTPUT of the wah, and the INPUT of the wah to your amp/fx. Fourth, the wah needs to be on, and I tend to find that the pedal should be about 3/4 of the way up (toe position). Fifth, wind up the volume, and you should start to get the sound. By twiddling the tone controls and the p/u selector (bridge, middle and the in-between work really well), you can get the crying sound as on Echoes, and 'Is There Anybody Out There?'. Posted by Manu Duran on Mon, 05/20/2002 - 09:32. Knows anyone how D.G. makes "the cry" you can hear in the central part of Echoes, and you can hear also in another song in the Wall -I think is in "is there anybody out there?-. Re: David Gilmour's cry 2? Posted by John on Tue, 05/21/2002 - 08:07. I think what you are refering to is a Synth. Its Rick Wright, not DG. : Knows anyone how D.G. makes "the cry" you can hear in the central part of Echoes, and you can hear also in another song in the Wall -I think is in "is there anybody out there?-. Posted by Skogkatt on Tue, 06/04/2002 - 08:23. It's definitely DG. Anyone who thinks it is NOT a single coil guitar plugged into a wah the wrong way hasn't heard it in action. : I think what you are refering to is a Synth. Its Rick Wright, not DG. : : Knows anyone how D.G. makes "the cry" you can hear in the central part of Echoes, and you can hear also in another song in the Wall -I think is in "is there anybody out there?-. Posted by Aksel on Tue, 12/02/2003 - 18:22.
: It's definitely DG. Anyone who thinks it is NOT a single coil guitar plugged into a wah the wrong way hasn't heard it in action. : : I think what you are refering to is a Synth. Its Rick Wright, not DG. : : : Knows anyone how D.G. makes "the cry" you can hear in the central part of Echoes, and you can hear also in another song in the Wall -I think is in "is there anybody out there?-. If you watch the Pink Floyd Live at Pompeii concert you will clearly see that it's not a synth. I think David uses some kind of echo/delay effect in combination with another effect. Maybe a Theremin? About the Fuzz used in Careful with that Axe Eugene. Posted by Allen on Sat, 11/06/2004 - 23:57.
: : It's definitely DG. Anyone who thinks it is NOT a single coil guitar plugged into a wah the wrong way hasn't heard it in action. : : : I think what you are refering to is a Synth. Its Rick Wright, not DG. : : : : Knows anyone how D.G. makes "the cry" you can hear in the central part of Echoes, and you can hear also in another song in the Wall -I think is in "is there anybody out there?-. : If you watch the Pink Floyd Live at Pompeii concert you will clearly see that it's not a synth. I think David uses some kind of echo/delay effect in combination with another effect. Maybe a Theremin? Sorry, don't mean to change the subject for a bit, but I've always wondered what type of fuzz David Gilmour used in Pink Floyd's late 60s albums like Suacerfl of Secrets, More, and Atom Heart Mother. He definitely did not use the Big Muff until the Darkside of the Moon Album. I heard he uses a Fuzz Face: is it the first germanium version, or was it the later silicon version in the late 60s? The fuzz I hear in the studio version of Careful With That Axe Eugene sounds more like a soft-clipping germanium sound, but maybe I'm wrong...maybe it is silicon Fuzz Face. Would anybody please tell me what type of Fuzz Face they think David Gilmour used. It sounds awesome. I'm trying to build one. Posted by gilmourdude on Wed, 05/22/2002 - 03:27. This popular thread has been given its own page : Re: David Gilmour's cry 2? Posted by Don on Thu, 05/16/2002 - 13:29.
can I get the electric mistress sounds out of it. I have heard that Polychorus is mix between Electric mistress and Clone theory chorus. Posted by John on Fri, 05/17/2002 - 13:39. I'm not familiar with the Polychorus, but I would definately get a delay! The bosses are good. I use an Ibanez that has digital delay and analog echo. I like it and it is a little cheaper than the boss pedals. Delay is a must for a lot of the FLoyd stuff. : can I get the electric mistress sounds out of it. I have heard that Polychorus is mix between Electric mistress and Clone theory chorus. Posted by Vince on Tue, 05/14/2002 - 00:26. For guitar, I'm planning on purchasing the EMG DG-20s, so I think that covers the guitar area. The only thing left there is to actually play like him ... and try to imitate his amazing bending and rhythmic style. For amps, I'm going to stick with those two Marshall cabinets, but for live shows, do you guys think adding a Hiwatt 100-watt head would be worthwhile? That way I could switch between the two. For compressors, I really like the Boss CS-2 and the MXR Dyna-Comp. I haven't looked at the Ibanez CP-9. Which of the three is the best to start with? Namely for the DSOTM sound? I've heard the Boss is used most by Gilmour. Then comes Distortion and Fuzz. I love my Ibanez fuzz box, and it is great combined with the Univibe for getting that Time Solo. 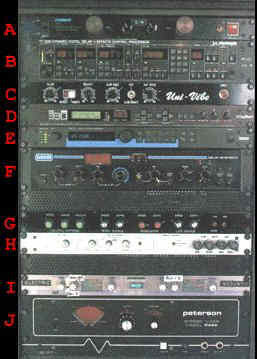 I am planning on purchasing a Chandler Tube Driver rackmount in the next few months. Will that combination handle most of Gilmour's distortion, or do I really need to spring for a Big Muff or a ProCo Rat? Also, I read somewhere that he used the Electro-harmonix Electric Mistress Flanger on almost every electric song on the Wall. Is this true? Is that effect really used that much? And now for the Leslie speaker imitation. I currently own a Dunlop Univibe and I love it. With the chorus mode on, and the speed at around 9 or 10 oclock, there is perfect Dark Side / Have a Cigar rotating speaker sounds. BUT, I have recently listened to a MXR Phase 90 and I was VERY impressed with that. It is a smaller pedal (good for the pedal board!) and it is about $120 cheaper! Do you think it would be worth it to sell my Univibe and obtain a new reissue of the Phase 90? I'm really not that interested in the Univibe's Vibrato anyway. And finally delay. I just bought a Boss RV-2, but it has yet to arrive. That should be able to handle basic delay for songs like Time, right? Then maybe down the road the rackmount TC Electronics delay system ... that looked pretty sweat. Posted by Paltsa on Tue, 05/14/2002 - 08:53.
also need EHX flanger. No boss or Ibanez will do it like EHX. Boss RV-2 is a reverb, but it also has a Delay, right. Posted by John on Tue, 05/14/2002 - 11:59. Posted by SCOTT on Mon, 05/13/2002 - 21:49. Posted by filmour on Sun, 05/19/2002 - 22:09. Try this order:crybaby,dynacomp,mxr booster,ts9,GT2,phase 90, equalizer all in the noise suppressor. Posted by John on Tue, 05/14/2002 - 11:54. Your pedal order should go by how you want it to sound. You will have different tonal qualities if you say put the mistress before the muff, and then try the muff before the mistress. I run my board like this, Compressors, Distortions, modulations, delays to Amps. Try it, if you don't like it play around until you find something you do like. Posted by Jay on Thu, 05/09/2002 - 21:58. Posted by Manu Duran on Sat, 05/11/2002 - 17:51. I think is only the Hiwatt amplifier distortion (low distortion), because there is not a very sustain, and is a clean saturation (tipical for the Hiwatt amps). Perhaps all with a Telecaster (bridge pick-up). Posted by gilmourdude on Fri, 05/10/2002 - 01:56. Posted by Nicolas on Sat, 12/10/2005 - 20:53.
what does he use for modulation also in Dogs? Posted by riis on Fri, 05/10/2002 - 21:58. I totally disagree. The Muff is far to dirty and has more sustain to it than the sound on Dogs. He probably used either a Fuzz Face or a distortion channel on one of his studio amps, probably a Fender. He also used a Pete Cornish custom fuzz, which is a blend of the Face and the Muff. On the tour though, he used the muff. Posted by gilmourdude on Thu, 05/23/2002 - 23:50.
: I totally disagree. The Muff is far to dirty and has more sustain to it than the sound on Dogs. The muff is never dirty when playing single note style leads. I use the muff when I play it live and it asounds like the record. Posted by riis on Thu, 05/09/2002 - 10:41. Hi, I was wondering if any of you guys knew what kind of overdrive unit Dave used on the earlier stuff. I believe he didn't start using the Muff before the Animals period. He used the fuzz face on most solos up until that. But as I'm familliar with this pedal I can't tell if it's the Fuzz face he uses on stuff like Childhoods End, Mudmen and live versions of Atom Heart mother, Cymbaline and all of that overdrive-not-quite-fuzz- stuff. Posted by Farley on Thu, 05/09/2002 - 22:15. How about the stock overdrive that he used in his studio amps? Just a suggestion. Boss seems to probably be your best bet. Posted by John on Fri, 05/10/2002 - 23:42. He mostly used the Fuzz on all his early stuff. There is a big difference in tone of the fuzz (distortion) if you use an EQ with it. fool around with a Fuzz Face and an EQ and you'll get pretty much what you're looking for. : How about the stock overdrive that he used in his studio amps? Just a suggestion. Boss seems to probably be your best bet. Floyd Cover Band In Seattle? Posted by Floyd on Fri, 04/26/2002 - 03:41. I spoke to somone about a cover band in Seattle area, if they could contact me maybe we could practice sometime? Re: Floyd Cover Band In Seattle? Posted by mark on Wed, 05/01/2002 - 03:27. Posted by Floyd on Wed, 05/01/2002 - 13:54. Posted by Dan on Thu, 05/09/2002 - 06:57. I can't remember their name, but I saw their flyer at Guitar Center. They are an ACOUSTIC Pink Floyd cover band! Posted by Paltsa on Sun, 04/14/2002 - 13:09. Posted by Manu Duran on Sat, 05/11/2002 - 17:45. He used the same equipment always (normaly, he incremented with the time). You can see in this web site. But the real diference is in the 80´s he began to use a new pick-up's set. The EMG DG-20 set. You can buy today. I have a Fender Stratocaster with this set and the sound is very great!!! I recomended if you a searching for Dave sound. Posted by filmour on Sat, 04/13/2002 - 15:37. Why my mistress (great sound! ), combined with distortion or overdrive,is so hysterical and exaggerated when I turn up the color? The sound is very deep and rounded but I hear a tiresome...uiiiuiiiuiiiuiii (forgive me!). When Dave use the mistress I hear the flanger and oscillating sound but not squeak or jet-airplane. If I set the rate at 9 it's more acceptable but the sound is empty. Posted by john on Sat, 04/13/2002 - 22:12. Thats the beauty and down fall of the Mistress. It is a noisy flanger, but nothing else really comes close. You can try adjusting the rate, color and range, but you said it is flat. Try upping the sustain or tone on your distortion. I've tried the Mistress with other distortions, but it doesn't sound the same without the Muff. It's like they were made for each other. The other thing you can do is try a noise gate, but make sure that your not cutting off frequencies that you want. Or...you can just live with it :) But, that really shouldn't be an option. : Why my mistress (great sound! ), combined with distortion or overdrive,is so hysterical and exaggerated when I turn up the color? The sound is very deep and rounded but I hear a tiresome...uiiiuiiiuiiiuiii (forgive me!). : When Dave use the mistress I hear the flanger and oscillating sound but not squeak or jet-airplane. : If I set the rate at 9 it's more acceptable but the sound is empty. Posted by filmour on Fri, 04/12/2002 - 14:45. What i have to do to replicate the intro-solo in the Momentary album? Clean guitar, compression and neck-pickup...ok! But what about the strange oriental sound? The mistress? Posted by John on Sat, 04/13/2002 - 04:34.
: What i have to do to replicate the intro-solo in the Momentary album? : Clean guitar, compression and neck-pickup...ok! : But what about the strange oriental sound? The mistress?